To mark National Vegetarian Week, we explore the digestive perks of a meat-free diet. A common question about vegetarianism tends to be: ‘Is being a vegetarian healthy?’ The answer is a resounding yes! Although your diet won’t automatically become healthier just by cutting out meat, it is what you eat to replace this food source (and the minerals it provides) that makes the vegetarian diet so beneficial. Eating a diet rich in fruits and vegetables means you consume more nutrients and are less likely to reach for congesting foods. You are also more likely to broaden your choices and eat nutritional foods such as pulses and beans, soya products, seeds and tahini to boost your intake of essential minerals. The result of this is generally better digestion and overall health. Eating lots of fruits and vegetables will instantly increase your fibre intake. This nutrient is key for good digestive health and helps you to feel fuller for longer. Fibre is considered effective for weight management and for preventing digestive problems such as acid reflux and constipation. Studies suggest vegetarians are less likely to develop diverticular disease. This is a condition that occurs when pouches form in the colon. These pouches can become inflamed or infected, and can lead to severe abdominal pain and bloating. There is also some evidence to suggest vegetarians are less likely to develop cancer – particularly colon cancer and heart disease. Some vegetarians continue to eat dairy products, which in the absence of meat can provide a valuable source of protein. Many will include probiotic-rich yoghurt in their diets, which is important for feeding gut ‘friendly’ bacteria to aid digestion. 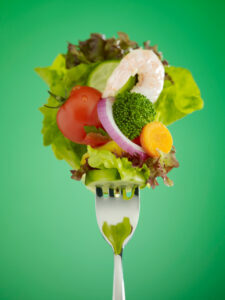 If you would like to start adopting vegetarian habits, you should strongly consider seeking professional advice. A nutritionist can provide valuable support tailored to your individual needs. Find a nutritionist near you today. View and comment on the original Yahoo article. Could your digestive problems be due to gut dysbiosis?